RTV is the first public access channel in Korea. It is celebrating its fifth year of broadcasting.This project grew out of the work of Mediact, an impressive media center in the heart of Seoul. 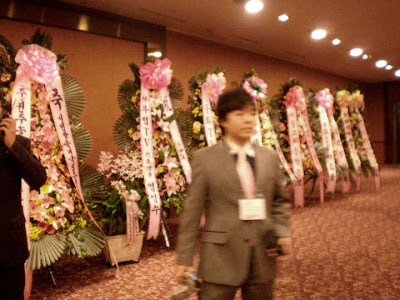 These sorts of flower towers are a Korean tradition. There was an entire row of them sent by corporations who do business with the channel. 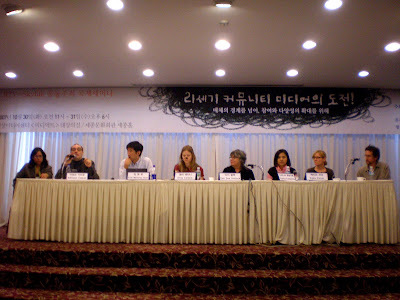 To celebrate the anniversary, there was a seminar on community media, with international guests: Catherine from Vive TV in Venezuela, Adilson Cabral from Brazil, Myung Joon Kim from Korea, Ellie Rennie from Australia, DeeDee Halleck from US, Supinya Kiangnarong from Thailand, Kate Coyer from Hungary and the US and Jon Stout from the US. 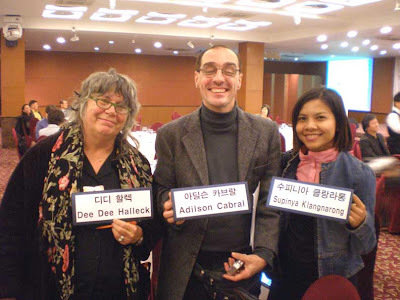 This is a trio from the US, Brazil and Thailand. Supinya Kiangnarong has been struggling to get freedom of expression in Thailand. 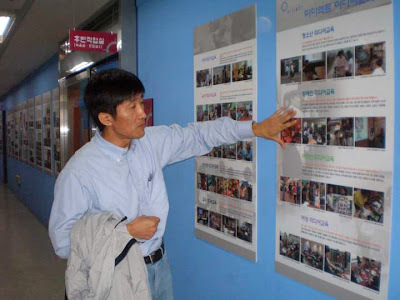 Myung Joon Kim, coordinator of Mediact, the Korean media center, explains the exhibit of five years of Mediact's work.